The U.S. Supreme Court justice spent Tuesday talking with educators and lawmakers about improving civics education in Washington. These days, she said, it’s more important than ever. If schools chief Chris Reykdal gets his way, civics education will become a required course for all Washington students. And he received a big boost toward that end from U.S. Supreme Court Justice Sonia Sotomayor, who was in Seattle Tuesday talking with teachers, law professors and fellow judges about the importance of teaching kids how, and why, to engage with government. Though she stopped short of making any overtly political statement, Sotomayor spoke with deep feeling about the likelihood that immigrant children who had fled other countries might be reluctant to either trust or participate in the political process. Her remarks came at the end of a day spent generating renewed interest in civics education and continuing the efforts of retired Supreme Court Justice Sandra Day O’Connor, who unveiled her iCivics initiative in 2009. Through its website and computer games, iCivics simulates the stakes and immediacy of participation in government. Sotomayor, the Supreme Court’s first Hispanic justice, helped to translate one of those games, “Do I Have a Right?,” into Spanish. In the game, players run a virtual law firm, evaluating the stories of potential clients to determine whether their constitutional rights have been violated. A Washington-specific version of the website also was unveiled yesterday. Sotomayor’s interest in bulked-up civics lessons matches that of Reykdal, who was a social-studies teacher before becoming a state legislator and, in 2016, winning election to the Office of Superintendent of Public Instruction. From that post, he is pressing a statewide Civic Learning Initiative in partnership with the nonprofit Council on Public Legal Education to improve instruction on the three branches of government, the U.S. system of checks and balances and the path a bill takes to become law. Such lessons used to be sacrosanct in high schools across the country. But they have atrophied under pressure to improve math, reading and other skills measured by standardized testing. “Every computer scientist still needs to be engaged in their community,” Reykdal said, promoting newly proposed legislation that would make civic learning a stand-alone course required for high-school graduation. Numerous national polls have shown paltry knowledge about the workings of U.S. government, among Americans of all ages. Only 26 percent, for example, are able to name the executive, judicial and legislative branches. Reykdal sees this as a crisis. 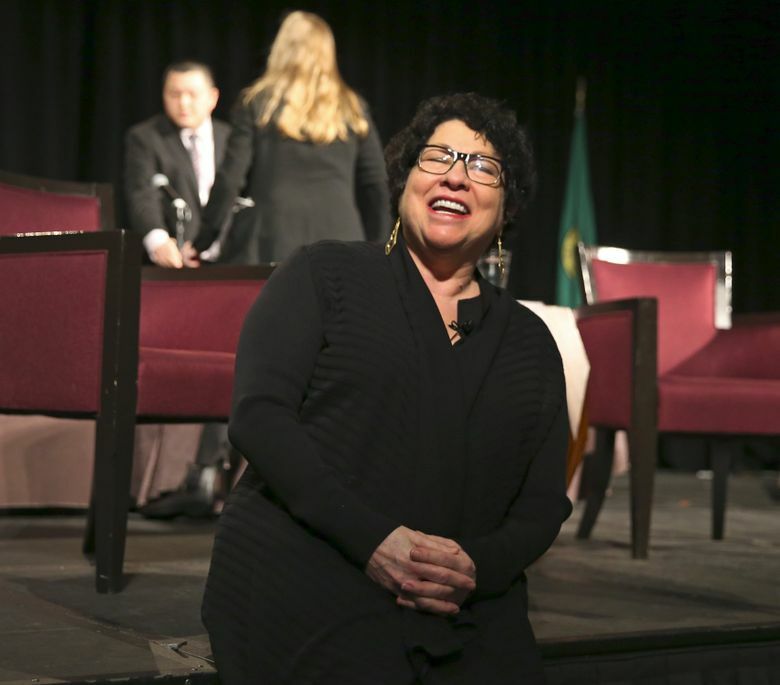 Fielding a question about the intense polarization in current American politics, Sotomayor sidestepped direct reference to the president or any political party. This story has been updated to include the Council on Public Legal Education.